Chuck Kobasew, of the Boston Bruins, ranks third on the team with 10 goals and four assits. "Go West, young man, and grow with the country." The phrase is credited to the 19th Century American newspaper publisher Horace Greeley, but some say he plagiarized it from an Indiana publisher. Chuck Kobasew, 25, a British Columbia native currently playing for the Boston Bruins, has turned that phrase around 180 degrees, but there's nothing counterfeit about the job he's doing for the Boston Bruins. "Kobasew has scored some big goals for us this season, important goals, including game-winning goals," Bruins head coach Claude Julien said. "He looks like he's really coming into his own and he's been a big addition to our club." It couldn't have come at a more desperate time. Since the Bruins lost scoring leader Patrice Bergeron to a concussion and broken nose on Oct. 27, Kobasew has scored seven goals and added three assists. He has 10 goals and four assists this season to rank third on the team in scoring. Given the success Kobasew already has enjoyed in Eastern Massachusetts, he might want to consider putting down roots in the land of the bean and the cod. Kobasew led Boston College to the 2001 NCAA men's ice hockey championship when he was named the MVP of the Frozen Four. He had his most successful professional season when he played for Lowell in the AHL during the 2004-05 NHL work stoppage, when he scored 38 goals and added 37 assists. "I enjoyed my time in the Boston area when I played for Boston College and again with Lowell," Kobasew said. "I had a lot of success with both those teams. The East is a great area and I like it a lot. Boston is a great sports town, the fans are great and I can't complain about that." The other stops in his hockey career have been a mixed bag. Kobasew grew up in Osoyoos, British Columbia, a few miles north of the Washington border and the southern gateway to the Okanagan Valley. Osoyoos is famous in Canada because it is in the country's only desert, home to many rare plant and animal species. Kobasew also has proven to be a rare breed. He was the MVP of the 1999-2000 British Columbia Hockey League Interior Division when he led the league with 54 goals and had 52 assists while leading the Penticton Panthers to the division title. He had an amazing single season at Boston College, scoring 22 goals and adding 27 assists in 43 games, and was named Hockey East Rookie of the Year and a Hockey East Second Team All-Star after finishing second in the league in goals. But it was his incredible performance in the postseason that would make him the Calgary Flames' first pick (14th overall) in the 2001 Entry Draft. Kobasew scored the tie-breaking goal against Maine to send BC to the Frozen Four. In the semifinal game, he had two goals in a 4-2 victory over Michigan, and in the Eagles’ 3-2 championship-game victory over North Dakota, he had the opening goal and an assist on Krys Kolanos' winning score. Kobasew made an unusual decision the next year, leaving Boston College to play for the Kelowna Rockets in the Western Hockey League, but it was a productive season as he totaled 41 goals and 21 assists. He had 21 goals and 12 assists the next year for the AHL’s St. John Flames, prompting his promotion to the NHL. He had four goals and two assists in 23 games with the Flames. Then came the season that left everyone shaking their heads. Kobasew went to the Flames' training camp as the No. 2 right winger behind Jarome Iginla, but produced only six goals and 11 assists in 77 games, and one assist in 26 Stanley Cup Playoff games as Calgary went to Game 7 of the Final before losing to the Tampa Bay Lightning. He restored some of the Flames' faith when he captained Lowell during the work stoppage and had a big year offensively. He had 20 goals and 11 assists in 77 games for Calgary in 2005-06 and it seemed his career was on the right track. But Kobasew suffered a concussion last Jan. 5 and missed eight games. When he returned, he broke his elbow. The Flames then traded him with Andrew Ference to Boston for Wayne Primeau and Brad Stuart. 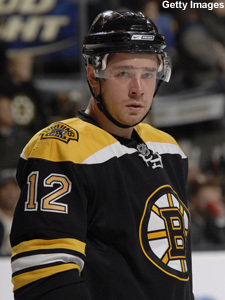 Kobasew played 10 games for the Bruins, but suffered another concussion and missed the last seven games of the season. "I tried to come back last year and I got hurt again," Kobasew said. "It was a very frustrating year so I'm not even thinking about it. I'm looking at this season as a fresh start." Interestingly, Boston traded former captain Joe Thornton to the San Jose Sharks and got back Primeau, Stuart and Marco Sturm. Kobasew now is skating on a line with Sturm on left wing. Glen Metropolit has been centering the line since Julien liked the way they played against Toronto on Nov. 20. "I like playing with Marco. He's an easy guy to read off," Kobasew said. "He has a lot of speed and he uses it to create opportunities for whoever he's playing with. Metropolit is a lot the same way. He's very experienced and very skilled. His skills are very underrated. He's been generating a lot of offense, too." Julien warned that other players were going to have to take up the slack after Bergeron got hurt against Philadelphia last month. Kobasew has been that player. The Bruins scored only three goals in a home-and-home series with Ottawa on Nov. 3-4 and Kobasew had all three. Still reeling from the Bergeron injury, the Bruins lost two more games before Kobasew had a goal in a 2-1 victory Nov. 10 over the Buffalo Sabres. He was plus-1 in a 5-2 win over the Toronto Maple Leafs on Nov. 15, and he had two goals and an assist Nov. 20 in the Bruins' 4-2 victory at Toronto. He had an assist on Metropolit's goal in Monday's 6-3 win at Philadelphia and finished the Flyers with an empty-net goal.